Order upon request. All items of Blue Fluted are assembled, painted and glazed by hand. The Blue Fluted pattern is part of Denmark's cultural heritage. To connoisseurs all over the world it is synonymous with Danish porcelain. The Blue Fluted service dates from the 1770s and was one of the first patterns to be used when the manufacturer was founded in 1775. Although the pattern originated from China and has been used in a multitude of varieties by porcelain factories all over the world, the Danish Blue Fluted has gained its world fame as the true Blue Fluted. 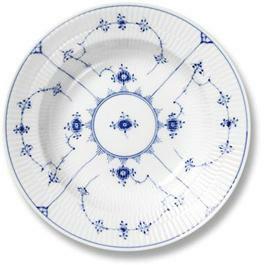 This is due to the fact that in Denmark it is the pattern still painted by hand by specially trained craftspeople; a tradition still carried on today by a new generation of porcelain painters – it is worth noting that it takes 1,197 brush strokes to paint a Blue Fluted dinner plate.